Does anyone use the phone book anymore? I came home from errands today and there were two at my doorstep. I was momentarily excited to find out that they were the “real” ones (I didn’t know they had fake ones floating around out there, too) but I get one or two or sometimes three of these books at random times throughout the year and I haven’t used one since the mid-nineties. I took a picture of these books right after I unwrapped them from the plastic and right before I put them in the recycling bin. I used to save them out of guilt. I mean, it probably took some guy lot of time to research all the names and numbers on the internet and type them up in neat little rows. After I moved a pile of 10 books from the cabinet in the kitchen to another cabinet in the family room – I decided that they had to go. I think one of them was from 1991. 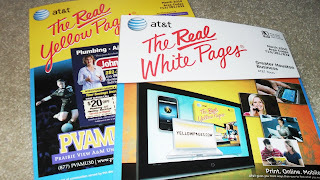 So – Am I the only one who thinks that the whole phone book business is just contributing to the demise of our environment….or do they actually serve a purpose? Please share your thoughts!